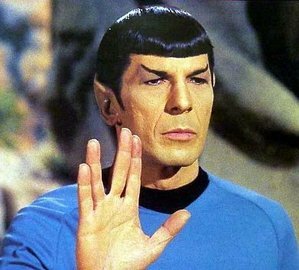 Spock, commonly Mr. Spock (sometimes popularly referred to as: Spock, son of Sarek), is a fictional character in the Star Trek media franchise. Spock was first portrayed by Leonard Nimoy in the original Star Trek series, and also appears in the animated Star Trek series, a two-part episode of Star Trek: The Next Generation, eight of the Star Trek feature films, and numerous Star Trek novels, comics, and video games. In addition, numerous actors portrayed the various stages of Spock's rapid growth, due to the effects of the Genesis Planet, in the 1984 Star Trek film Star Trek III: The Search for Spock. In the 2009 film Star Trek, Nimoy reprised his role with Zachary Quinto, who depicted a younger version of the character, existing within an alternate timeline. Both reprised their roles in the 2013 sequel Star Trek Into Darkness and Quinto reprised his role again in 2016 Star Trek Beyond.